BRACEBRIDGE — David Grand has thousands of government certified pot plants growing his new industrial greenhouse here. “We have maybe 9,000 or 10,000 plants,” he told MuskokaTODAY.com Monday morning. But you can’t buy his Muskoka Grown cannabis product in retail stores that began opening today across Ontario. He’s only selling his finished marijuana to other suppliers for online government and medicinal and dispensary purposes. 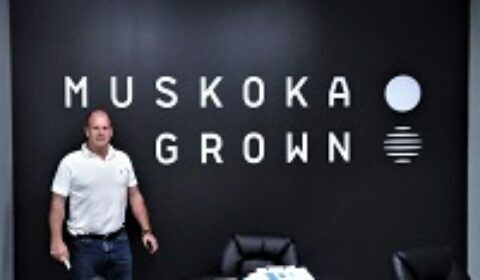 Muskoka Grown owner David Grand is selling his cannabis to other suppliers – just not in retail stores. And while he’s not totally happy with that and he would still love to have his own retail outlet at either his Keith Road grow-op or in town, he says it’s not up to him. “They changed the rules, so towns under 50,000 can’t get a licence” to sell directly to the public. He hopes that may change one day. Meanwhile, he has to be content with just being a rather large supplier and his multi-million investment is waiting to see how the first day of the retail rollout goes. And for the government’s next round license issues when the rules surrounding who can sell and where may change. Right now there’s no real way for cannabis users to find Muskoka Grown at the retail level. A search online doesn’t reveal anyone else marketing the locally-grown and manufactured marijuana. Grand hopes that maybe by the summer people will be able to buy Muskoka Grown under its own name — somewhere, if not at least online. David Grand shows the mechanics of his operation, which has been operating since last summer. Inside the Bracebridge plant, Muskoka Grown is growing between 9,000 and 10,000 cannabis plants for Canada’s legal marijuana market, which opened up last October. David Grand and his investors have put close to $20 million into growing pot he hopes to soon retail. The site where the former Alcan plant was, with its large electrical grid, is home to Muskoka Grown. In a green, nondescript plant off Keith Road in Bracebridge security is tight around the grow-op.